After a much-needed five day break from the Universal Orlando Resort, on Friday afternoon (November 8, 2013) I ventured to UOR to make my first post-Halloween observations. And since we are talking about the same swiftly-expanding resort that built Transformers and Springfield USA in a matter of months, there are already noticeable new construction changes in both CityWalk and Islands of Adventure since Derek Burgan’s observations earlier in the week. Let’s start with an exciting new signal of progress: white smoke emerging from the Red Oven Pizza Bakery smokestack. White smoke? We must have a new pope in CityWalk! Inside, staff members were preparing for an employees-only test service. Rumor holds the quick-service restaurant may open for business as soon as Tuesday, November 12. Also in CityWalk, the facade of the new restaurant that is replacing Latin Quarter has been covered in construction tarps, and should soon start receiving detailing. Do I detect a Spanish Mission style beneath the tarps? The table-service eatery’s future named was whispered to be “Don Quixote,” but Screamscape recently reported that It will be called “Antojitos,” which is a type of Mexican tapas. Inside Islands of Adventure, one place where there isn’t much visible progress is the new Starbucks in Port of Entry. After riding Transformers multiple times during Halloween, I was overdue for a spin on its spiritual predecessor, the Amazing Adventures of Spider-Man ride. Fortunately, this 25 minute posted wait was one of the longest I saw this day, as the resort was at 3 out of 10 on our Universal Orlando Crowd Calendar. I may be hallucinating, but I believe the prop photo in the darkroom (seen in Spidey’s express queue) has changed poses. Can anyone confirm? Over in Toon Lagoon, the minimal wait time (5 minutes) tempts a few idio…er, guests…into braving Bilge Rat Barges, despite the crisp weather. Wicked children with quarters are always waiting at the ready to soak them for their foolishness! Ripsaw Falls also had a few drenched takers. Next we visit Jurassic Park for the first sign of the new E-Ticket attraction being readied for the expansion plot behind Thunder Falls Terrace. That orange flag is a construction survey marker that may herald the return of King Kong. The River Adventure is also rumored to receive some TLC before Jurassic World is released in 2015. …and a video of the Egg Nursery, which is a high-tech variation on the old-fashioned “duck pond” game. The games themselves are very well themed (by Bob’s Space Racers of Daytona Beach, which also built the games in Universal Studios Florida’s Springfield and Disney California Adventure‘s Paradise Pier). But the prizes are disappointingly garish and generic. Where are the freakin’ dinosaurs??? Thankfully, a Universal manager assured me that themed prizes should be on their way shortly. Break time! And there’s nowhere better than The Watering Hole, where annual passholders can get happy hour drink discounts from 3 to 5 p.m. daily. Double-sized mixed drinks for $6.50. Cheapskate lushes rejoice! Next stop: The Wizarding World of Harry Potter (original edition). Yup, still pretty (especially when you crop out the show building to the right). So, where are all the people that aren’t in the rest of the park? Even on a slow day, Hogsmeade’s narrow streets feel crowded. But looks can be deceiving. This is the entire queue for Olivander’s Wand Shop! …and the signature E-ticket is practically a walk-on. I’m impressed by the continual improvements being made to Forbidden Journey, both in ride movement and projection clarity. Plus, all the effects (including the dragon’s movement) appeared operational. For a fascinating look at what the attraction might have been, check out this recent post by Orlando United’s HateToFly. Outside the Wizarding World, construction continues on the Hogwarts Express train station and surrounding area. 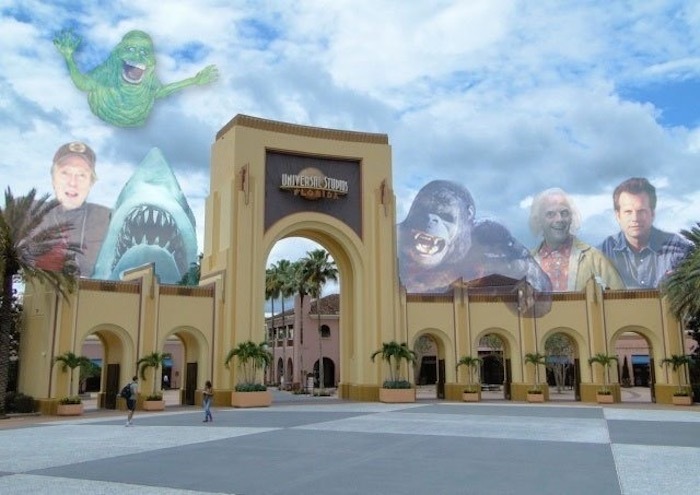 Now that Jurassic Park’s games are open, expect these to go away in the near future. Some of the games seem almost abandoned already. The Seuss Landing trolley train ride is being refurbished until November 23. No Seuss for you! Finally, here is a parting look at the remanents of CityWalk’s Endangered Species store, soon to become a Starbucks.